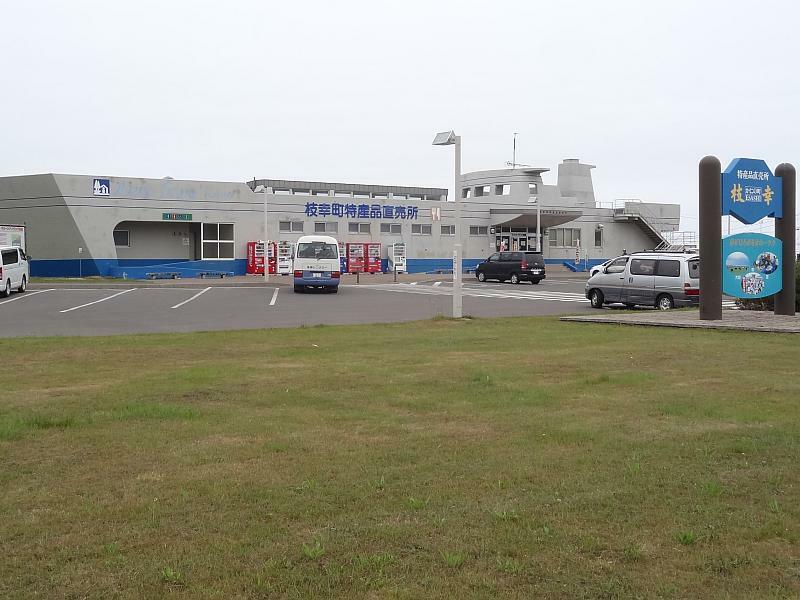 ← Hokkaido – Tomakomai to Soya Misaki. 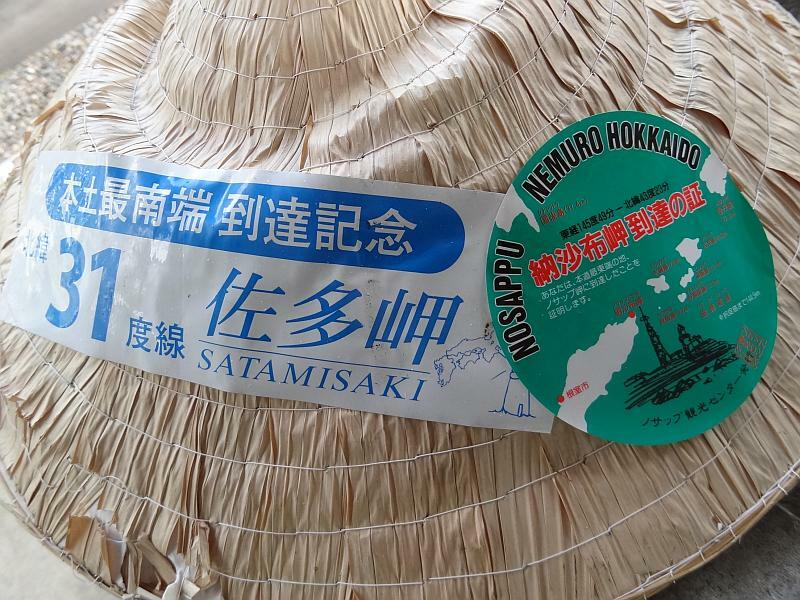 Hokkaido – Soya Misaki to Nosappu Misaki. 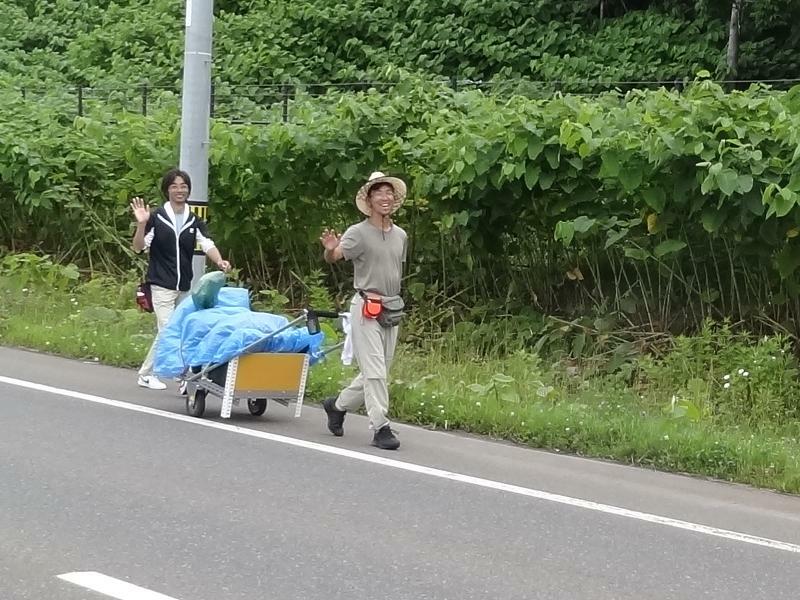 Saturday 7th July (continued) – Soya Misaki to Hamatonebetsu. Becomes strong side wind after leaving Soya Misaki as I head down the coast. 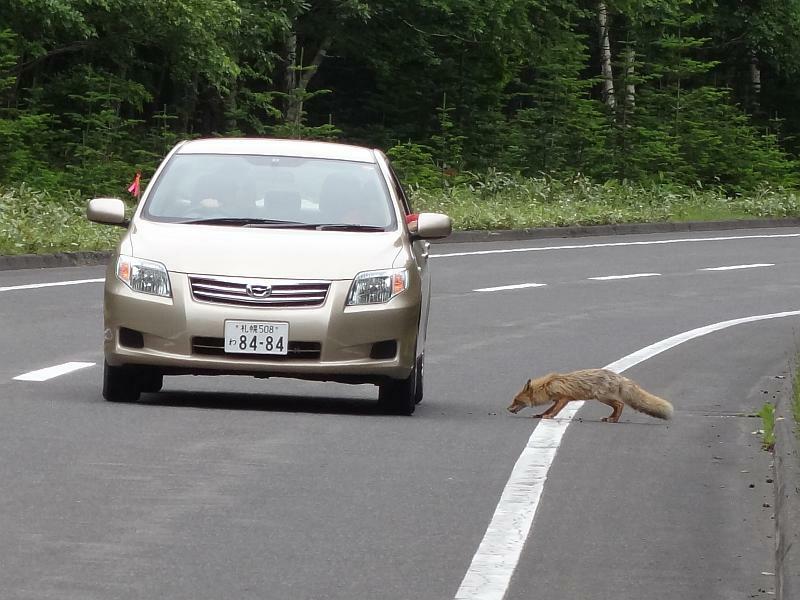 Meet a Hokkaido fox and a couple of cyclists going the other way. Get onto the back road I used last year. Make it to Hamatonebetsu at around 7:00pm. It is festival time and campground is busy. They let me stay free. There are team performances similar to kapahaka of what looks like school pupils. 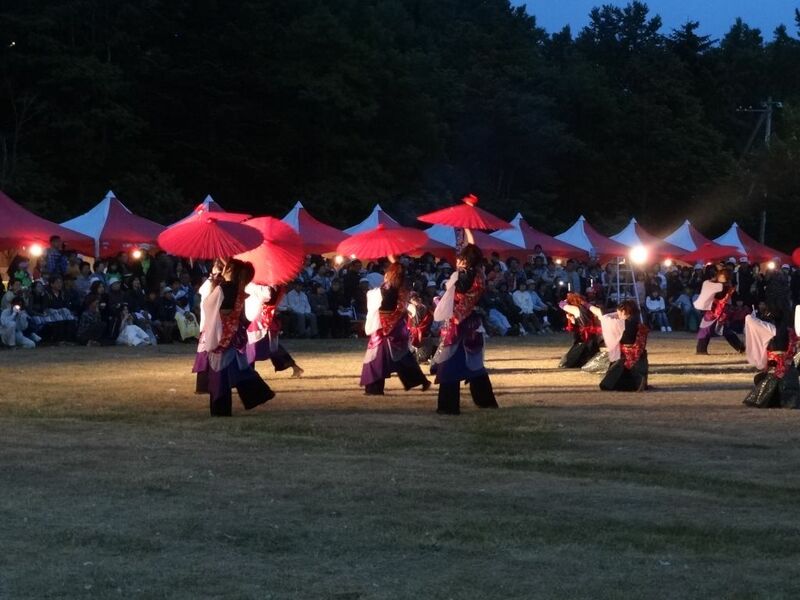 Impressive, and is followed by fireworks – hanabe. Hunger is avoided by a food stall selling chicken and chips. Fireworks are quite impressive too! 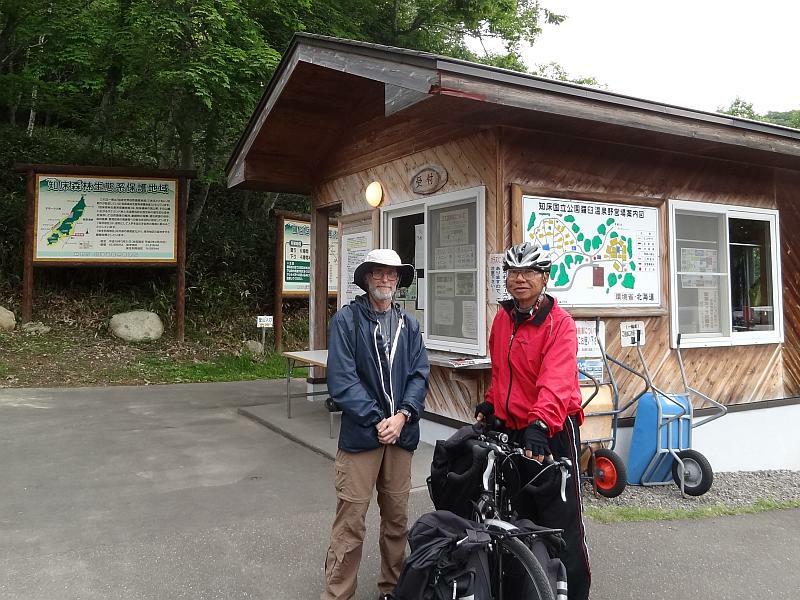 Sunday 8th July – Hamatonebetsu to Okoppe. Have met Junzou in the campground, the 5th time since Morappu. He makes me breakfast, including ham and egg, delicious! Such as nice change from banana and bread! Thank you! 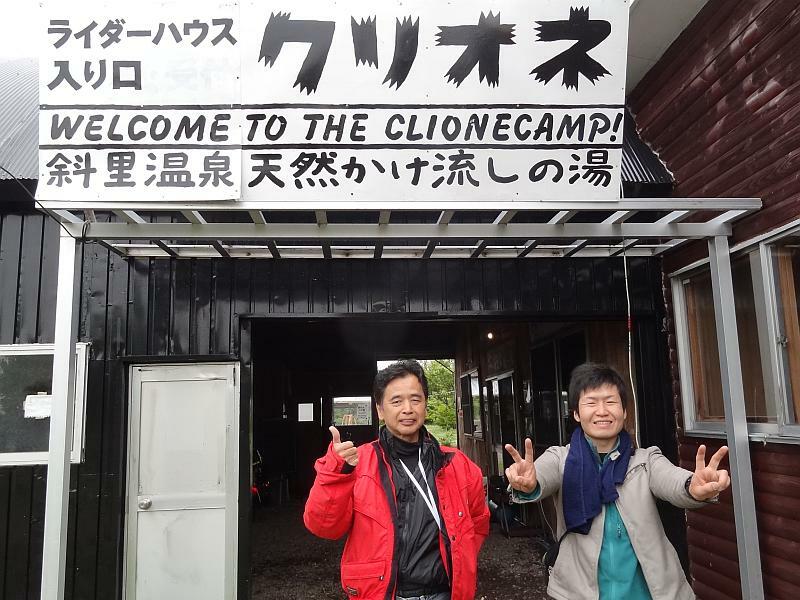 Junzou and I at the Hamatonebetsu campground. Meet cycling Mr Lee from Taiwan at the Seicomart. He has already ridden 40km and I am just starting. Head wind for the 90km to Okoppe so not sure I can make it. Intermittent showers promise more rain but fail to deliver. 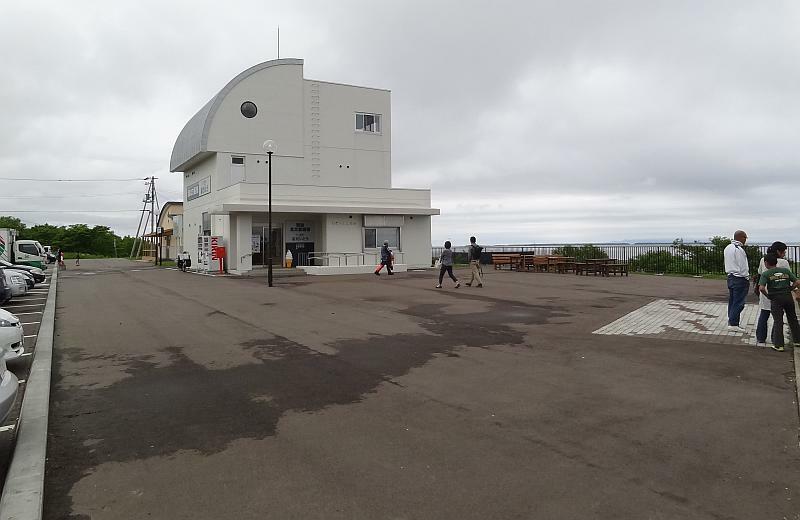 Arrive at Esashi Road Station, built in the shape of a ship and meet two other cyclist there, who are heading north. Shortly after leaving a fox comes right up to me, usually they are timid and run away from humans. Seems slow going but eventually I arrive at Okoppe right on 6:00pm. Mr Lee is there with 3 other people, he and I are the only two who talk. Go to sleep to the sound of heavy rain and I’m very happy I am not camping. 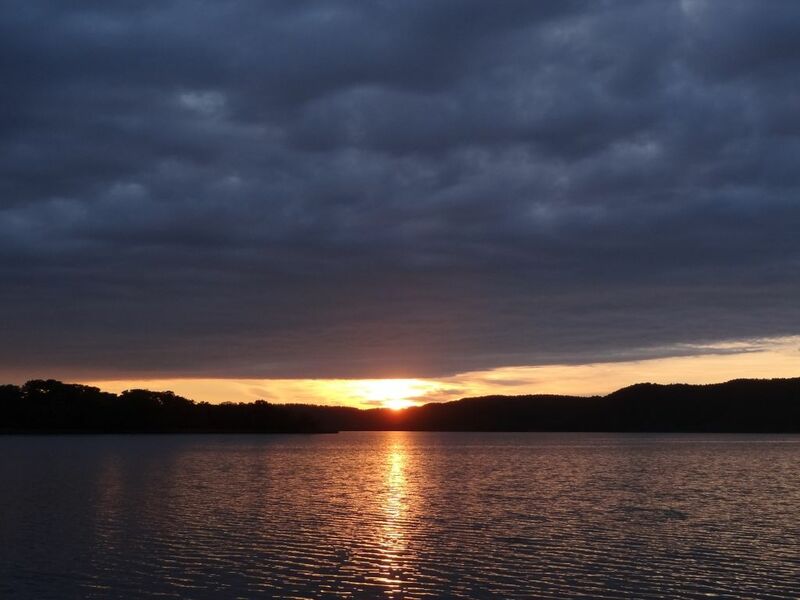 Monday 9th July – Okoppe to Saroma-ko. The rain stops early morning and I head off. Say bye to Mr Lee. Occasional showers dying out with another headwind. The Okoppe Seicomart doesn’t have rubbish disposal boxes so take mine inside but the attendant refuses to accept it. Never had that before. They sold the rubbish to me so have a responsibility I think. I go out and leave it for her to remove later. Progress down the coast is slow. The weather is nice as is the forecast so decide to stay at Saroma-ko campground like 4 years ago. Arrive at 6:00pm just as the office closes and cannot use the shower, damn! Dark clouds gather and just as I erect my tent it starts to rain. It gets heavy, move tent to a more sheltered spot as strong wind picks up. So much for the forecast! 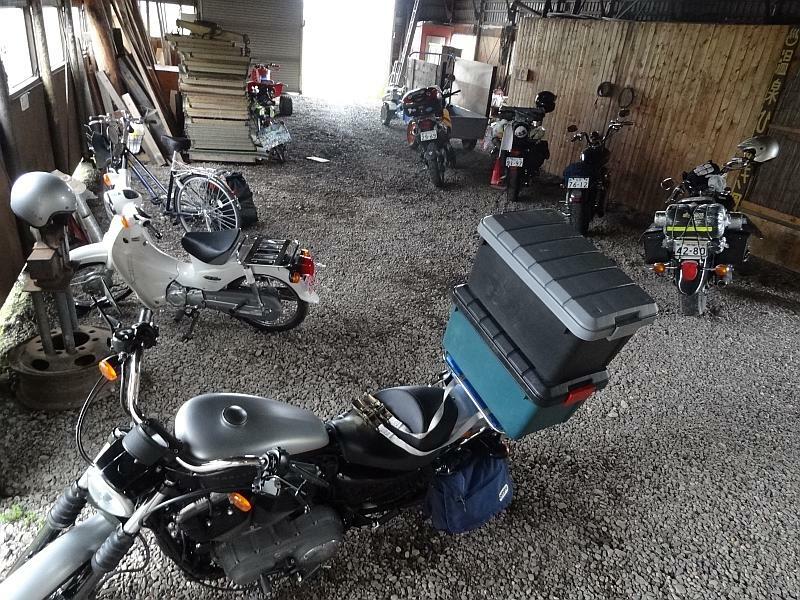 Tuesday 10th July – Saroma-ko to Abashiri. Fine by morning and looks like a tailwind for a change. 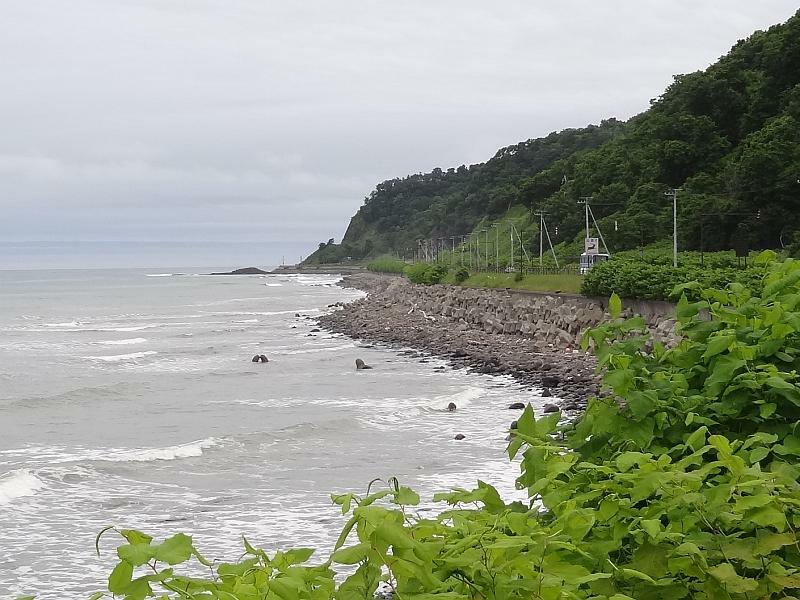 Get onto the cycling road to Abashiri. See fox, arrive at Ubaranai where there is another rider house in train. 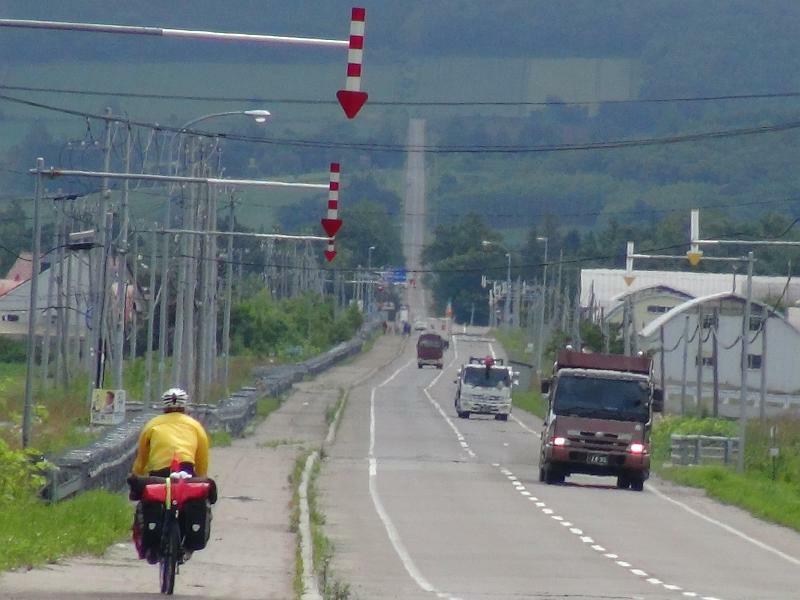 The cycling road to Abashiri. Take a few photos, have early lunch. Just about to leave I discover a coffee shop in the old station. 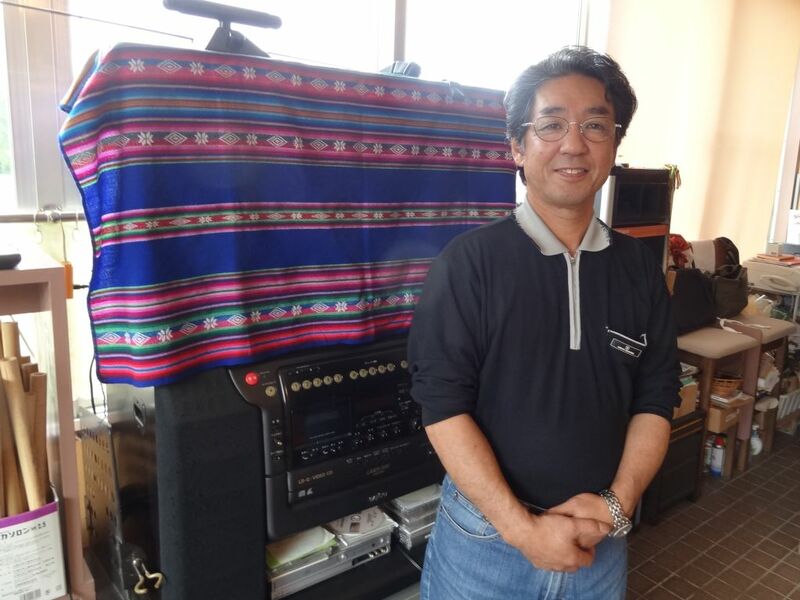 Meet Hiroaki the manager who is into Bolivian music and making flutes. Have an interesting chat, record him do a performance and have a nice coffee. Thank you Hiroaki! Hiroaki, the coffee shop manager, maker of fine flutes and Bolivian music! 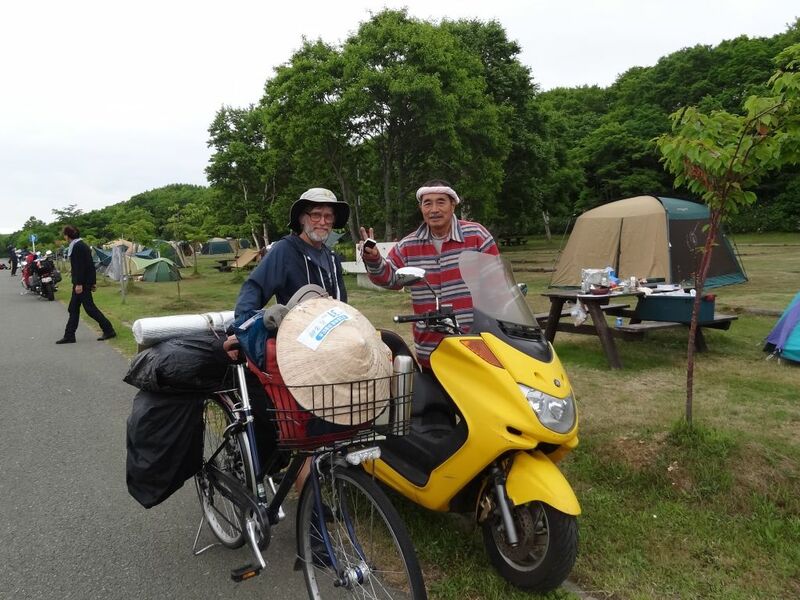 Arrive at Abashiri early afternoon, use internet at the info centre then go to the campground. Take onsen at nearby hotel. Chat to interesting lady on the way back to the campground. Another nice sunset over Abashiri-ko. 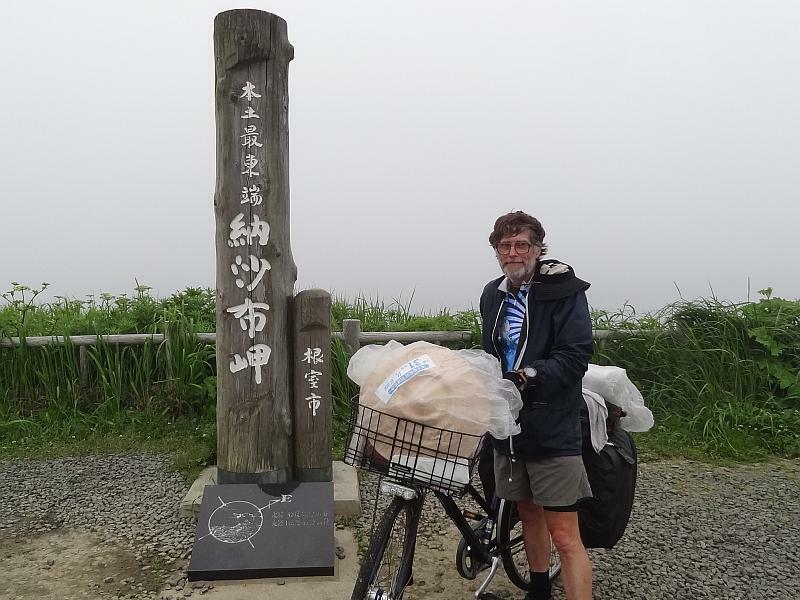 Wednesday 11th July – Abashiri to Shari. Nice sunny day, washed clothes and decided to pack up and go instead of staying. Have another Sukiya meal, like yesterday. 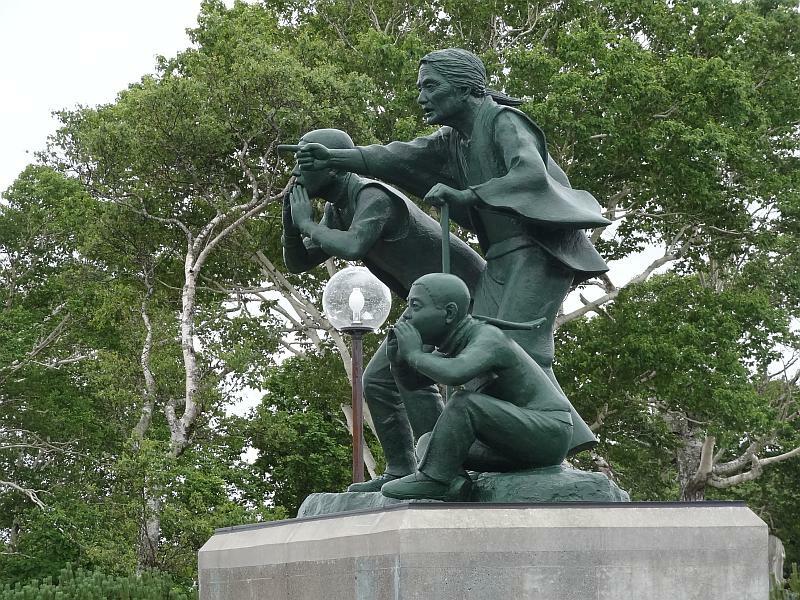 Abashiri has a prison museum and is famous for the sea ice in winter. I believe it, as it is cold enough in summer! Use info centre’s internet until 3:00pm then head for the rider house at Shari, 40km away. 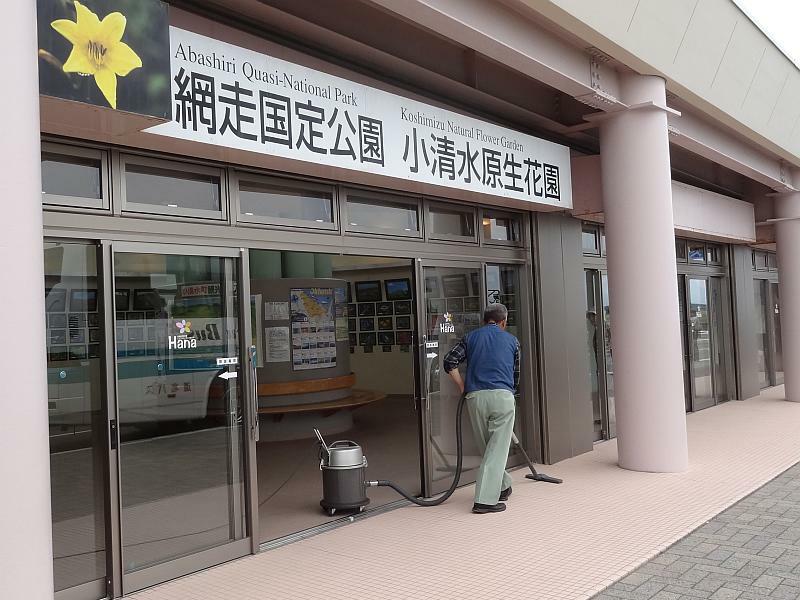 Abishiri Quasi-National Park and Koshimizu Natural Flower Garden. I arrive at 7:00pm, passing Abishiri Quasi-National Park and Koshimizu Natural Flower Garden on the way. Rider House is a nice place. Well set up and run. 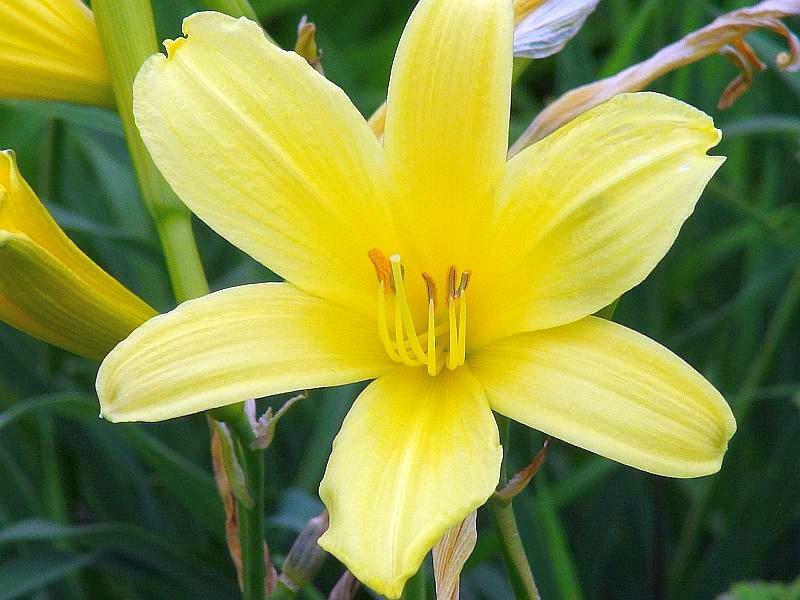 A bloom in Koshimizu Natural Flower Garden. Forecast at 3:00pm was good until tomorrow afternoon but clouds have started to gather and it is raining by night time. 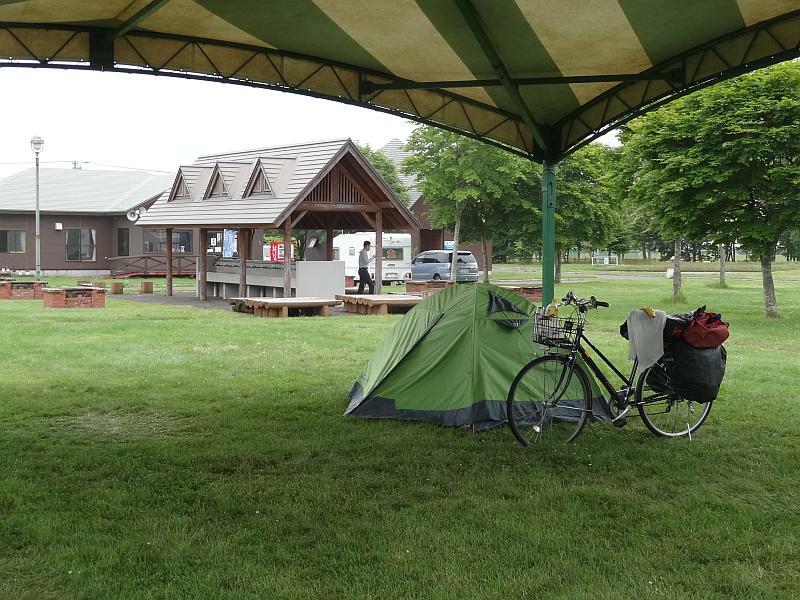 Good job I decided to leave Abashiri campground! Thursday and Friday 12th and 13th July – Shari. Rest days, rained most of Thursday so stayed another night. Went shopping before lunch. Watched two Shiretoko videos at the michi-no-eki. 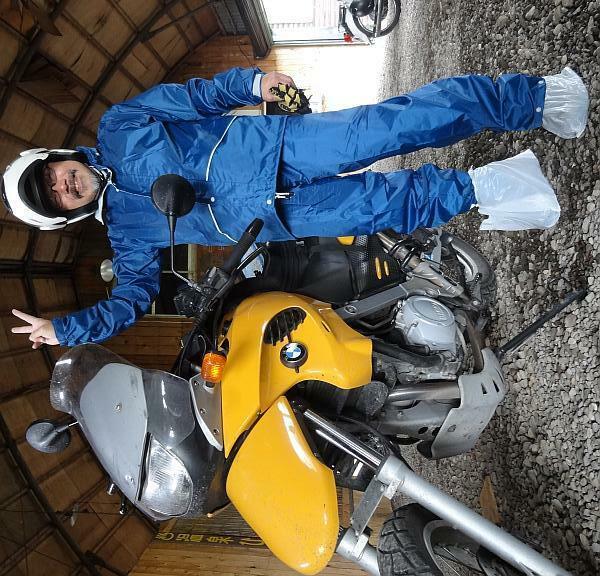 BMW rider uses plastic bags for shoes! Staff are helpful and friendly. Thank you Sachi for letting me use your computer to do the long delayed photo editing and blog update, so stay another night! Only the second time I have stayed 3 nights, the last time was at Aso on Kyushu. Owner gives me slice of melon. 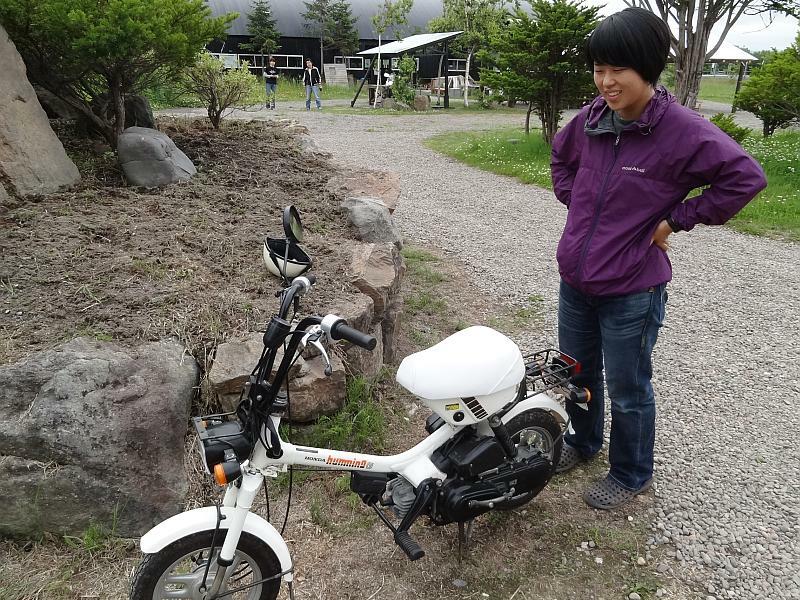 Sachi with her “new” bike! 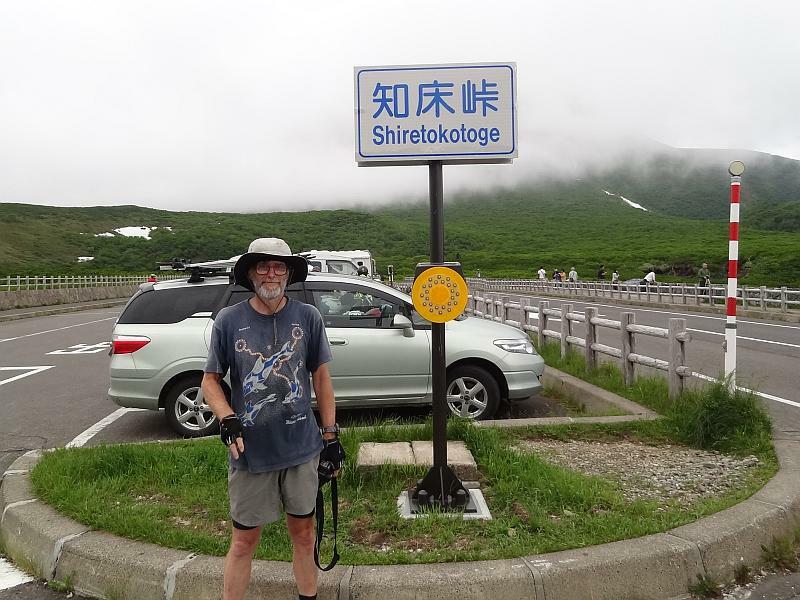 Saturday 14th July – Shari to Rausu. Easy ride to Utoro, meet a couple of cyclists, one of whom stops to chat. 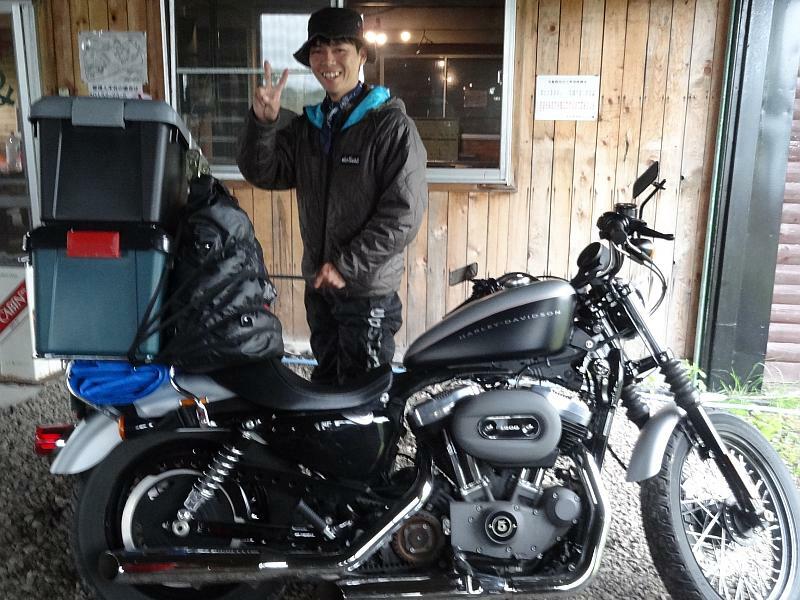 Mr Lam from Hong Kong, now resident in Hokkaido and on a weekend ride over Shiretoko Touge (Pass) to Rausu. Mr Lam from Hong Kong. This is an area of long straight roads, nearby one goes for 28kms! 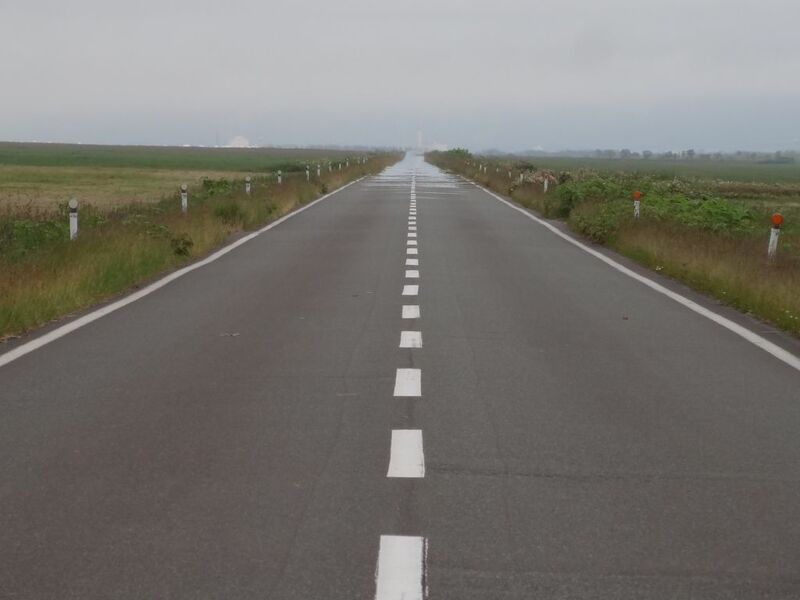 Heading towards Shiretoko Peninsula, note the long straight road. The steep climb over Shiretoko Touge starts just after Utoro. 20 years ago I did it going the other way, on what was the last cycling day of a 6 week bike ride. 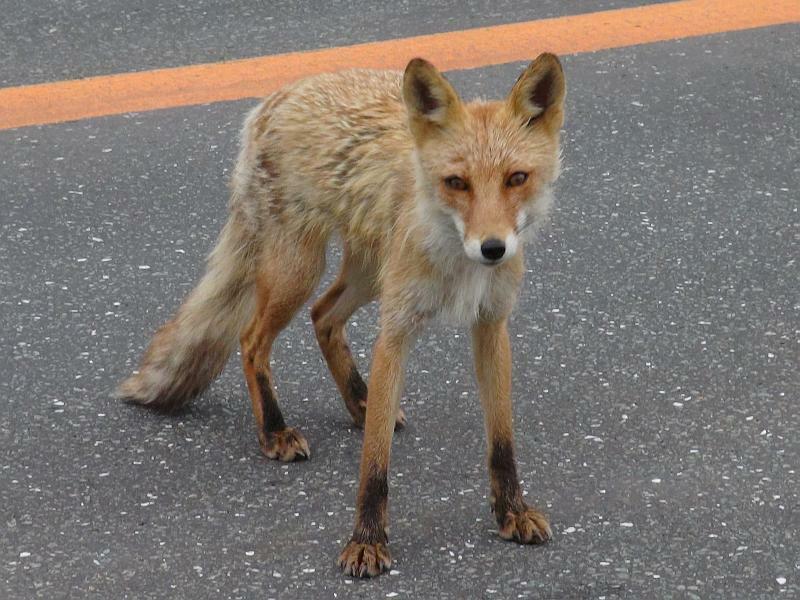 This time on the way up, pass a couple of friendly Hokkaido foxes. Watched from a distance as someone in a car stops and feeds one of them. Also saw a deer but no bears. 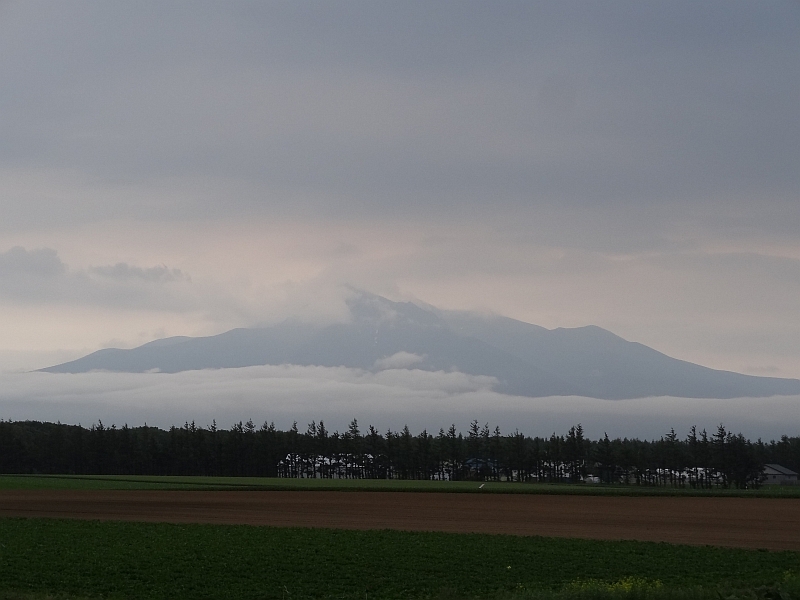 When I arrive at the top the clouds part and we can see Mt Rausu for a few seconds. Then just as quickly they close in again and wind picks up. Summit of Shiretoko Pass, just before the cloud descends and I flee! Starts to look like it could get unpleasant so quickly leave, it is a long run downhill from here! While cycling down and running the video camera, people in a car and on a motor bike go past me on bends. Very silly people! Screech to a halt at the first sign of habitation and smell of sulphur. As I do the following car also stops, and the passenger hangs a greenstone tiki pendant out of the open window. She says “New Zearand, right?” “Yes sure, wha….” and was about to have a conversation when they drive off, to park their car I thought but they keep going. This is the campground and onsen we stayed at 20 years ago. The onsen is still free but the campground charges a fee. It has also expanded with more tentsites and an office. Deer graze in the campground untroubled by people. The onsen is busy – it is Marine Day long weekend. Went for a stroll around the camp while it was still light. 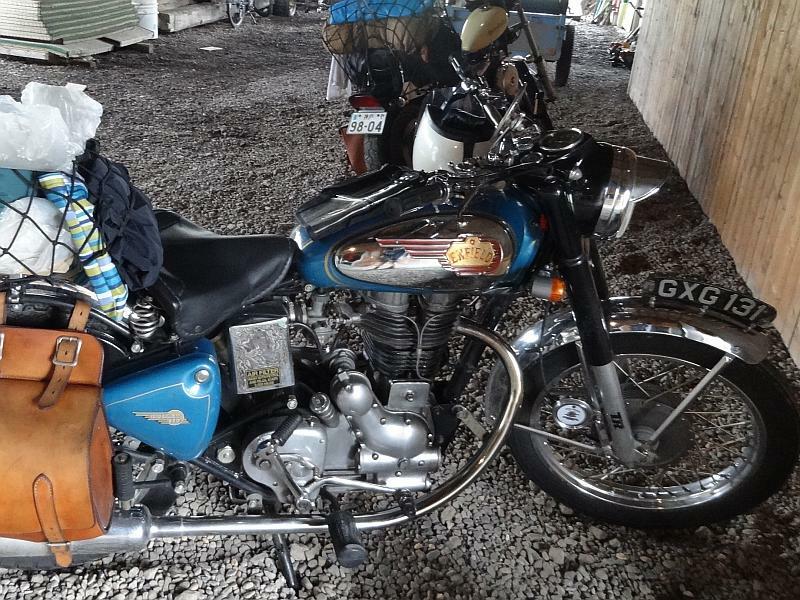 See a bike with what look to be familiar clothing but owner is away. 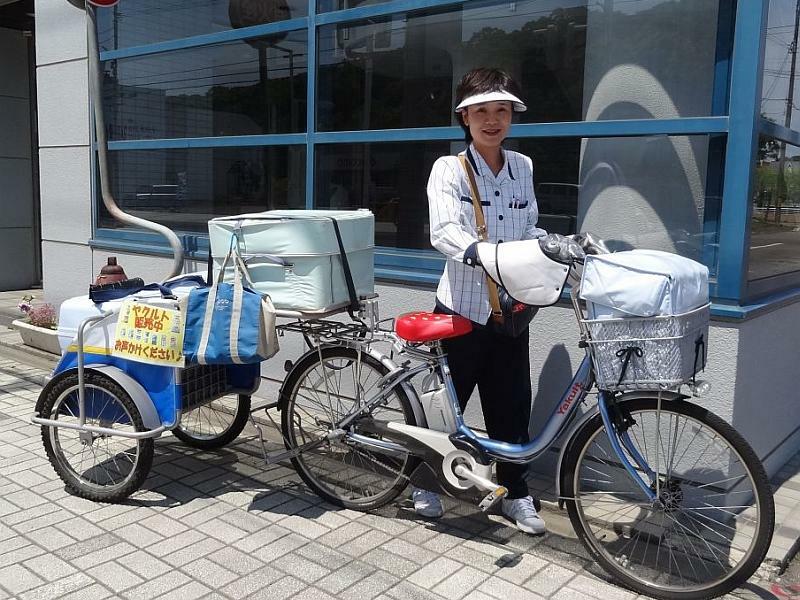 Hear people speaking English and see one is a girl wearing a headscarf, a rare sight in Japan. I guess she is probably from Malaysia. 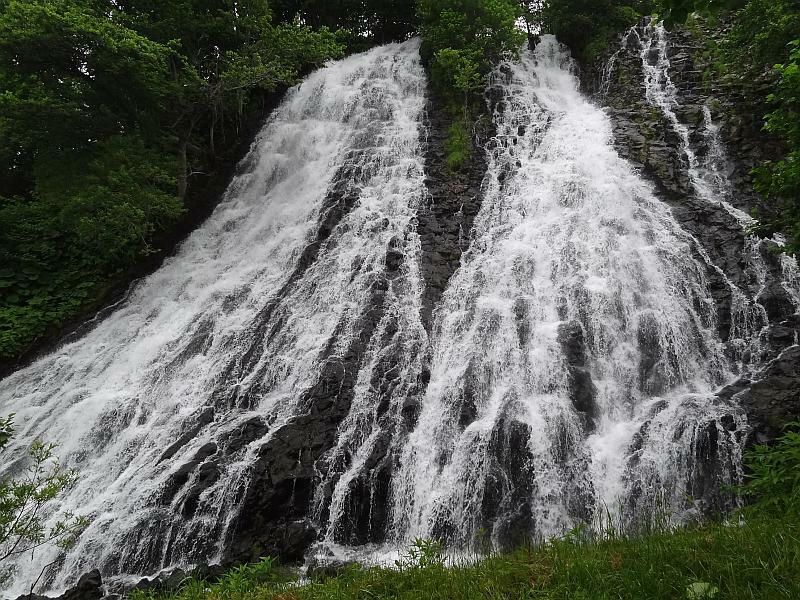 Sunday 15th July – Rausu to Betsukai. Pack up and go check to see if the bike has left. No but is about to do so. 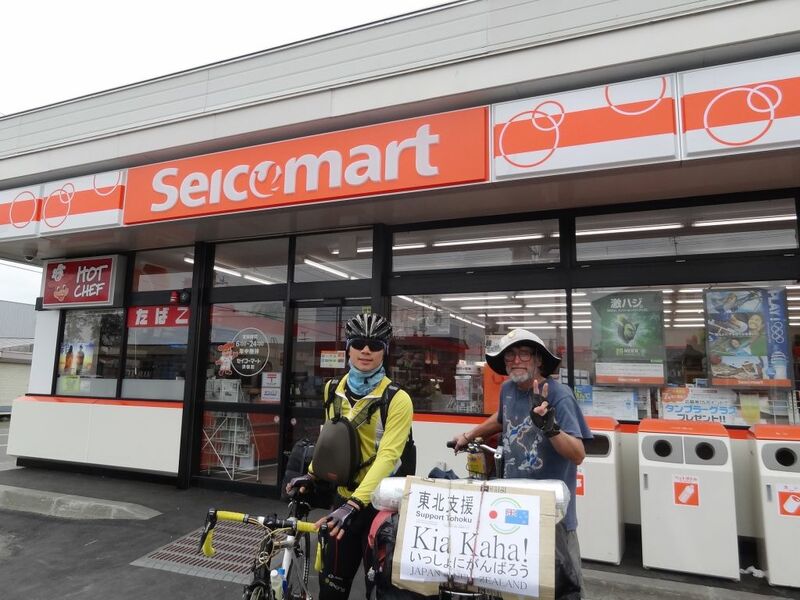 Sure enough it is my friend from Kagoshima who I first met at Nadachi Road Station south of Niigata. we waste a bit of time catching up. 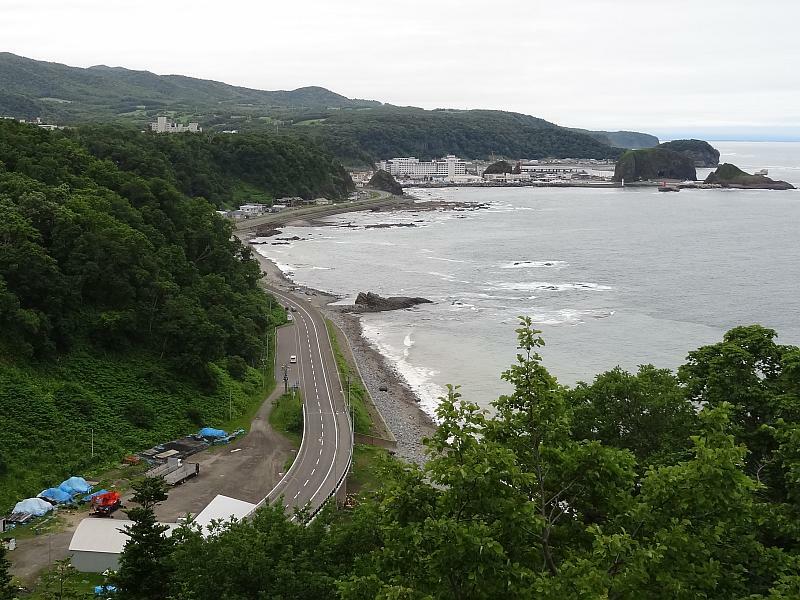 Overcast when I finally depart but start with a 5km freewheel downhill to Rausu. As I leave the michi-no-eki someone shouts and see a lady waving. Never sure what to do in these situations I keep going – are they waves of farewell or come and talk? Maybe it was the tiki lady from yesterday (both cars were white), but guess I will never find out now. Easy run down the coast but stays overcast and cold with headwind. 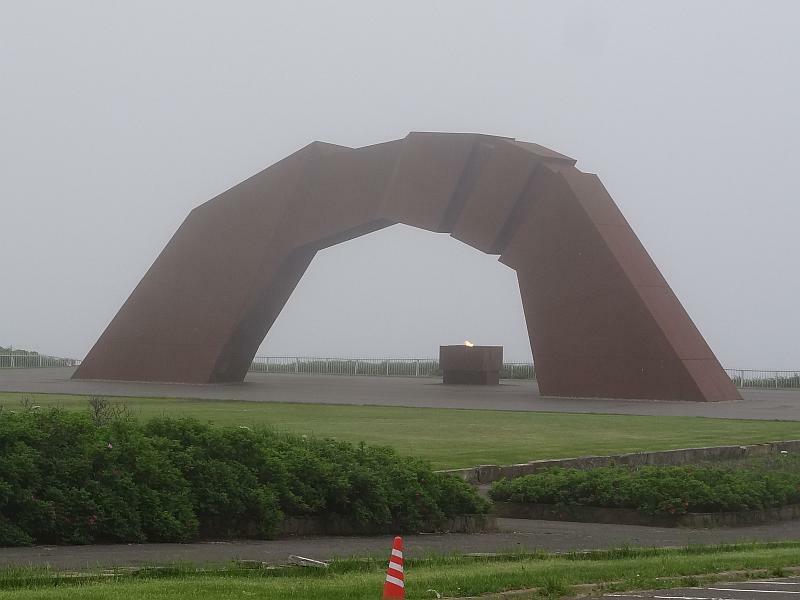 Discover there are no campgrounds on Nemuro Peninsula, the nearest being at Betsukai. The last rider house is too early to stop so keep going. My Kagoshima friend said he was going to the Betsukai campground, which is the nearest place to Nosappu, so decide to head there. 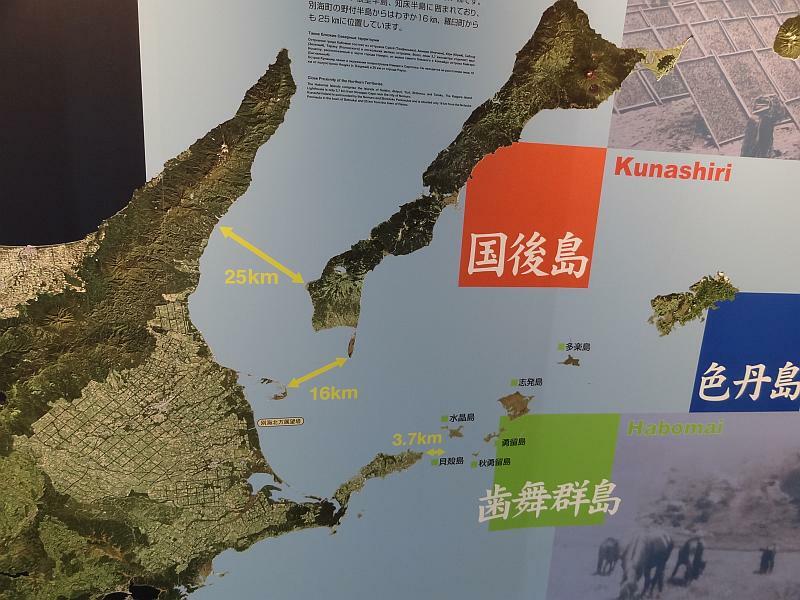 On the way stop at a newly opened michi-no-eki with a display on the 4 islands Russia invaded at the end of World War II and still hold today. Interesting stuff, something I was not aware of. Relations between the two countries are restrained while the islands remain occupied. No transport services operate to or from the islands. Kunashiri, one of the islands occupied by Russia since WW2. At a convenience store someone stops to talk. Toshi is from Tokyo and moved here 5 years ago. He is friendly with JET language teachers in the area, having once dated a Kiwi lady on a contract there. 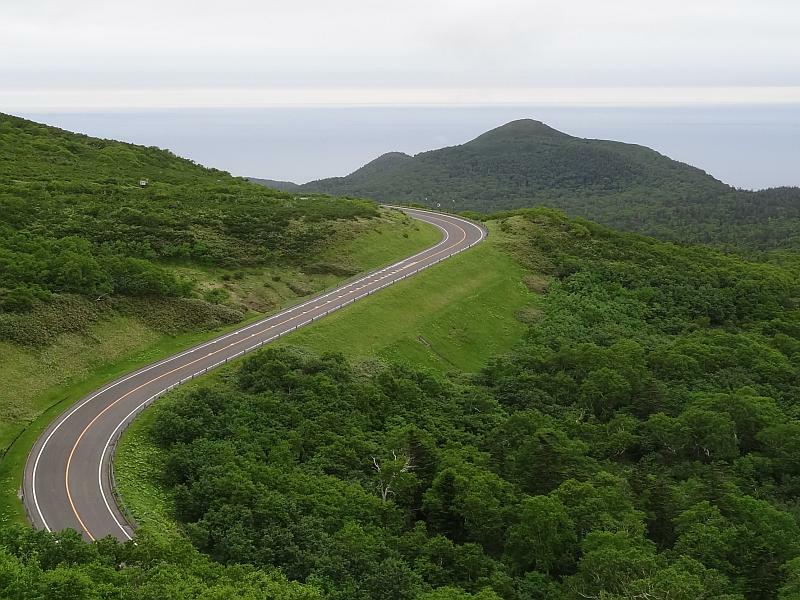 He tells me of the best route to Betsukai – along some backroads. I take it but kind of get lost due to there being a shortage of road signs and low cloud hiding landmarks. I first realise there’s a problem while crossing a river – it is going in the wrong direction! The roads are long, straight and deserted! For the first time I use the compass on my watch. Sure enough I need to turn round and go the other way. Fortunately it was only about 2km so no big deal. Arriving at Betsukai before dark I make my way to the campground. I am surprised to see my friend has only just arrived. 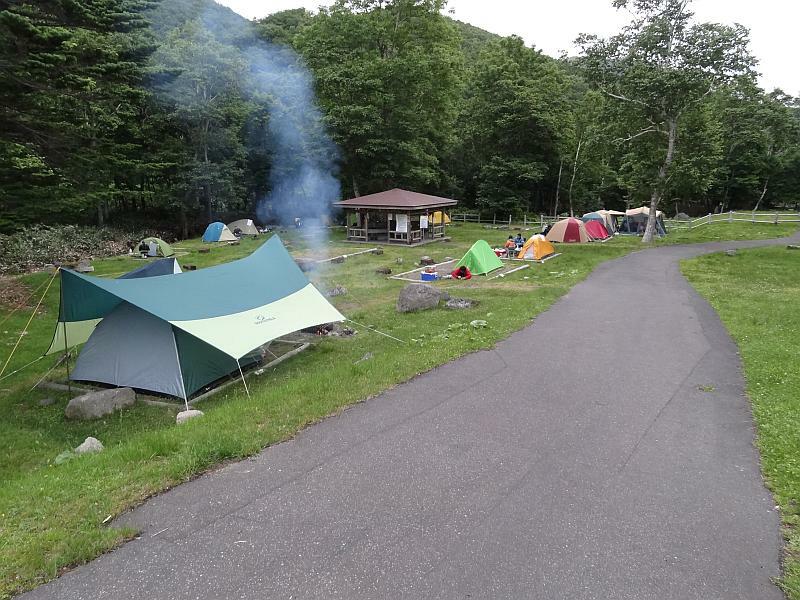 The campground provides a large awning as shelter for around 6 tents, there are four of us. The cloud descends to become mist with a gentle drizzle. At 600yen the onsen is the most expensive yet. 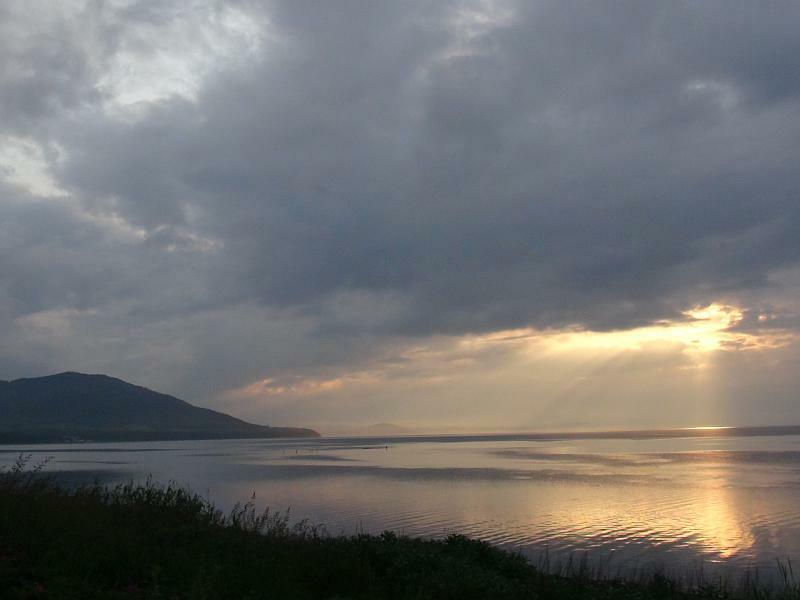 Monday 16th July – Betsukai to Nosappu Misaki. 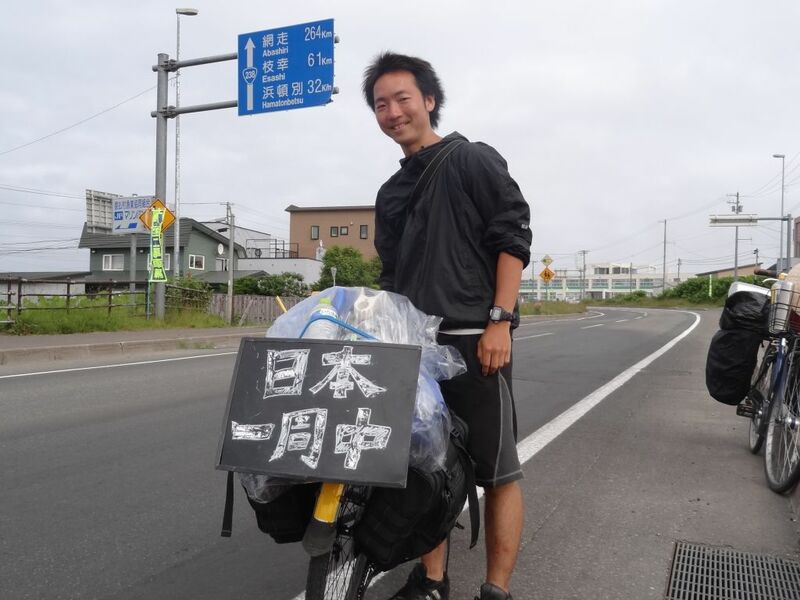 My friend got a job on a farm yesterday, so instead of going to Nosappu Misaki as intended he is cycling home to Kagoshima and returning with his car. We say bye-bye. 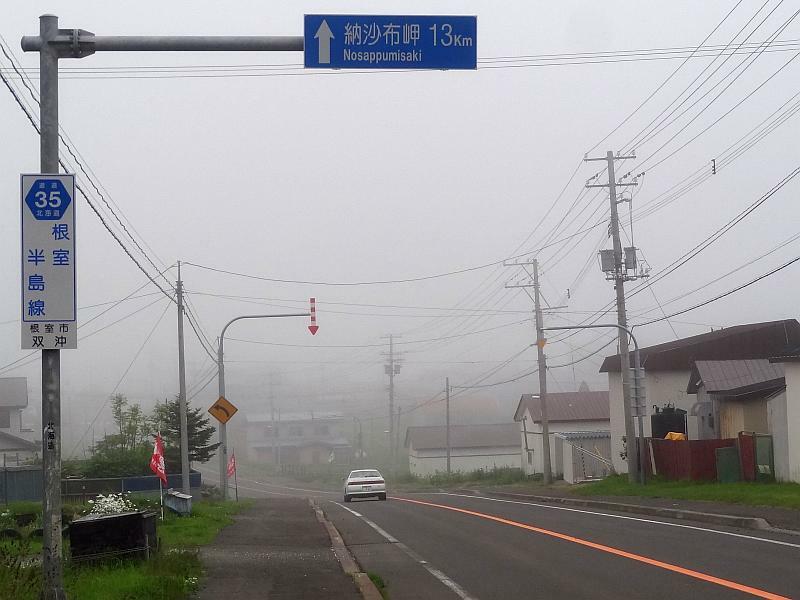 Proceed towards Nemuro, the nearest town to Nosappu Misaki, under low cloud and sometimes gentle drizzle. At Swan 44 michi-no-eki ask about camping and told there is none, but can unofficially stay there if I want. 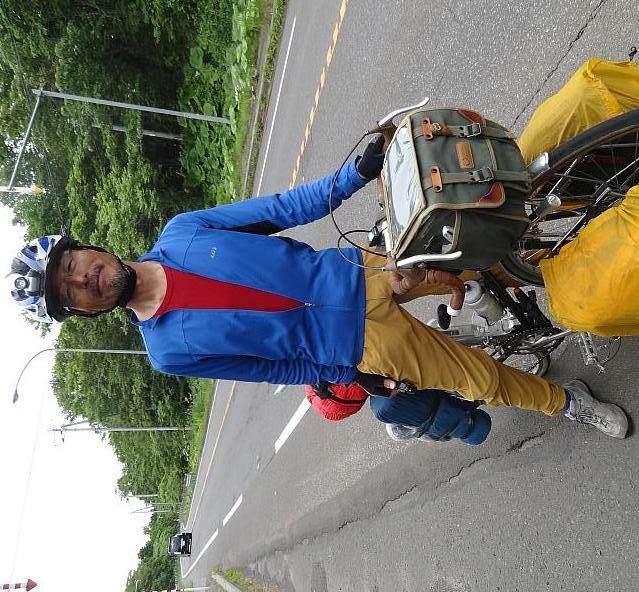 Soon after leaving a passing cyclist from Kyoto stops to have a chat. 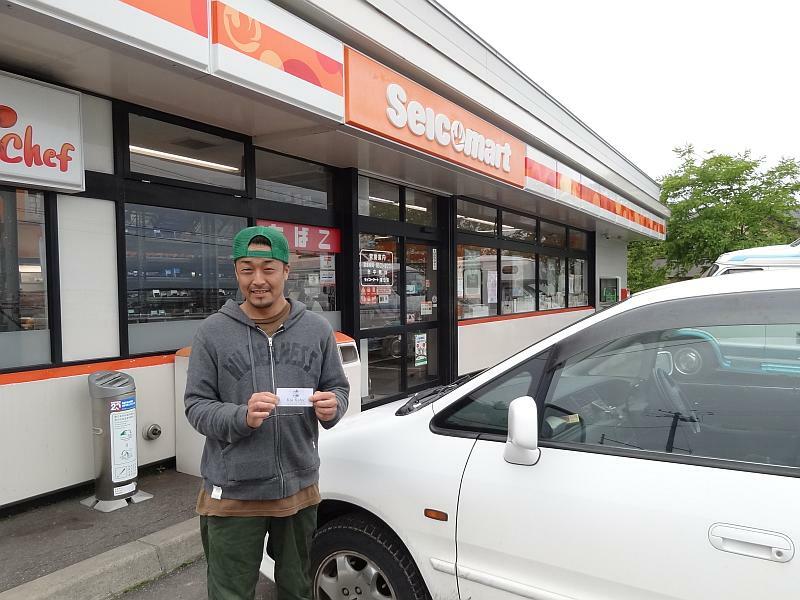 He tells me of the the place he stayed in Nemuro – free but must spend at least 1050yen on crab meat. Same applies to the one at the cape. I don’t want to buy any crab so consider my options. In fact he is the first of about 6 cycle tourists who pass going the other way today. One even had a Maruishi Emperor! Not quite like mine but close. 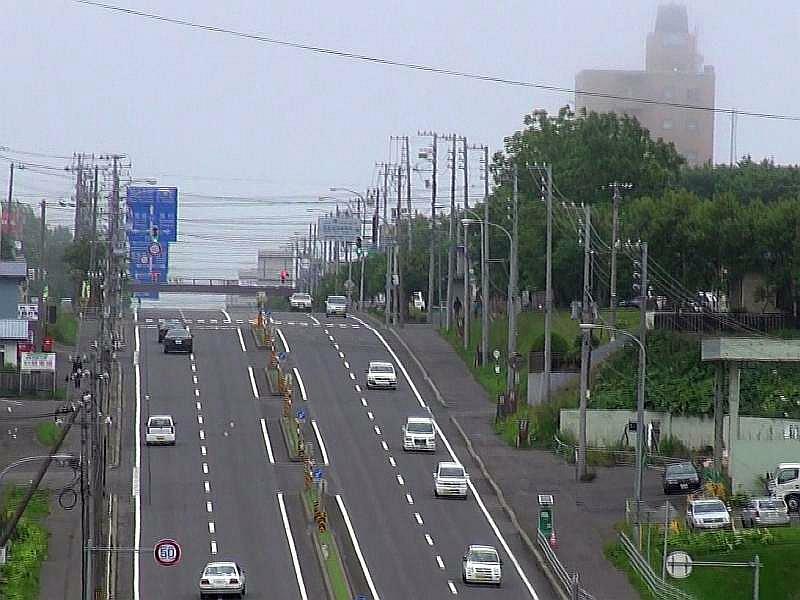 Arriving at Nemuro the low clouds lower and become fog. Real fog, and cold, not more than 10c. If it wasn’t the last official day of the ride it could be really depressing! Continue on the last 22km with no change. At 3:00pm I’m finally on the last stretch – Nosappu Misaki. A collection of mostly old buildings with more shops than tourists. And not a bus in sight, meaning probably the sort of tourists who don’t spend money. Wander around for a bit, take a few photos, look at the monuments, buy an ice cream and bumper sticker. 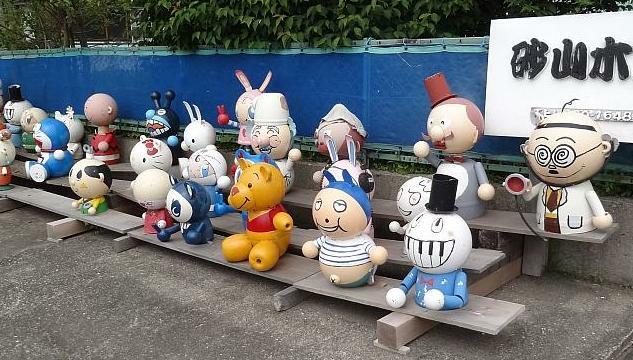 There are four Japanese islands off-shore that were occupied by Russia at the end of WWII and remain so to this day. It is still foggy and cannot see them. Take photos of me at the cape, but when inspecting more closely, it seems to be not quite the most easterly point. I ask in the souvenir shop and discover that the real end point is behind the lighthouse, hidden under a blanket of fog. 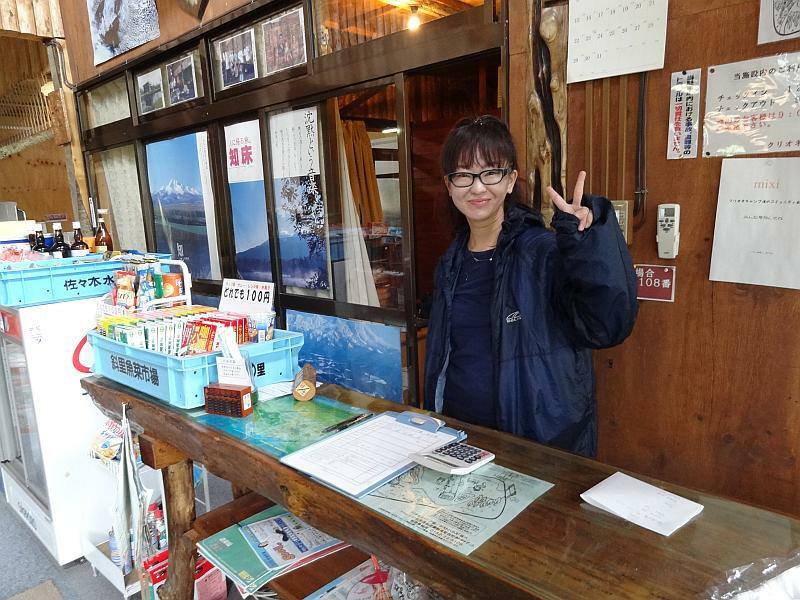 Go over to the lighthouse and meet the people speaking English at Rausu yesterday. 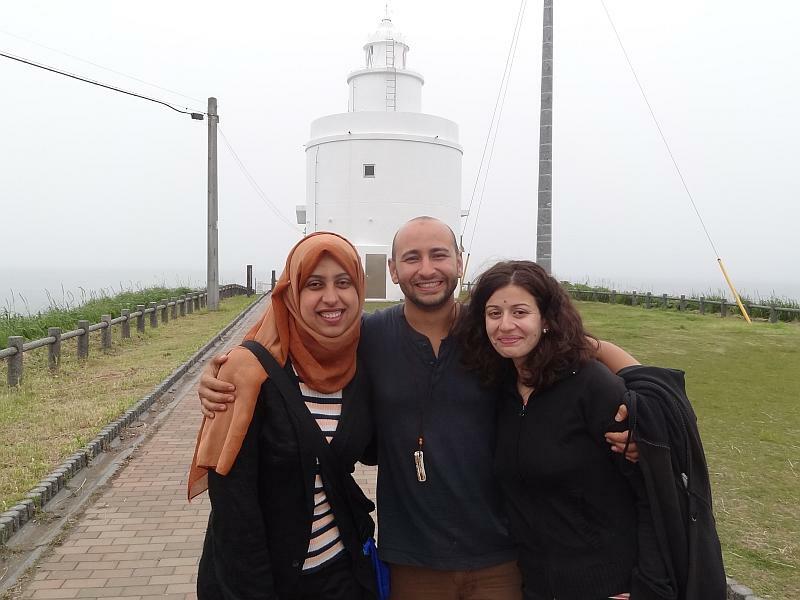 They are from Libya, Egypt and Jordan, (quite a long way from Malaysia) and study at Sapporo University! My curiosity is satisfied. After a chat we continue our separate ways. Now I have reached the fourth and last corner, all there is left is to turn round and go back. It is not really the end, now I go to Tohoku. 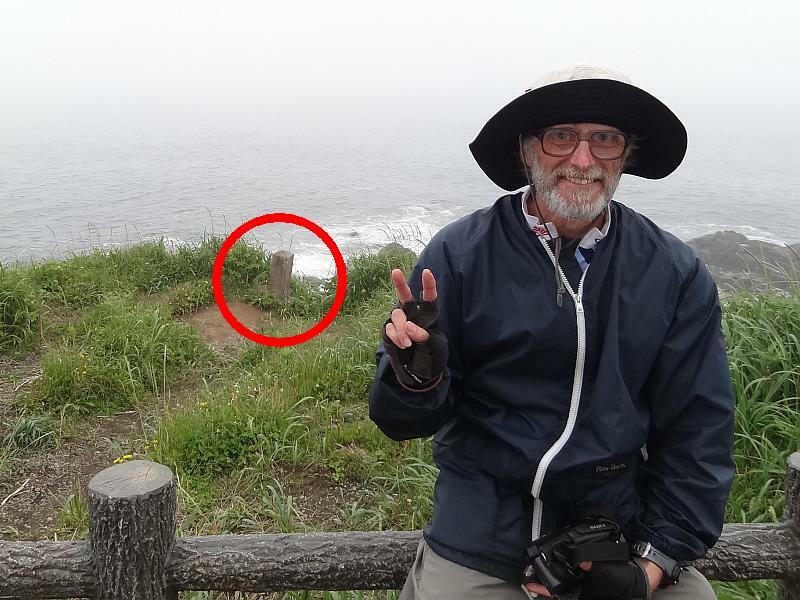 The red circle indicates the real Nosappu Misaki! 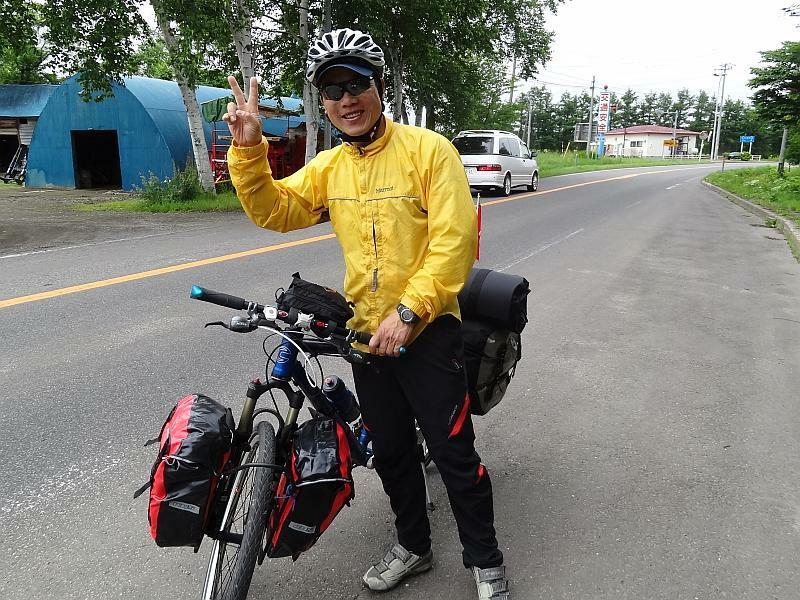 This entry was posted in Cycle Touring, Hokkaido, Nosappu Misaki., Soya Misaki and tagged cycle touring, Hokkaido, Japan, Nosappu Misaki, Soya Misaki.. Bookmark the permalink.